On Sunday night, 60 Minutes ran a segment about the high cost of medical school and New York University's recent decision to make its medical school tuition-free. The piece, hosted by Leslie Stahl, fits neatly into an increasingly popular narrative that higher education should be "free" the same way that public K-12 education is (which is to say, free to students who attend because someone else—taxpayers, donors, etc.—is footing the bill). At the very start of the piece, Stahl conflates the heavy debt that medical students routinely take out with all higher-education debt. This sort of rhetorical arbitrage is common among politicians and analysts who are pushing for debt forgiveness and more tax-supported financial aid for college and grad students. Such a move seriously distorts the conversation about the actual cost and availability of college to the typical American. About three-quarters of medical students who graduated in 2018 took out loans. Of those borrowers, the average and median amount was around $200,000. That's a lot of money to borrow, but it's also a pretty smart bet. According to figures from ZipRecruiter, most doctors earn between $150,000 and $312,000 a year, so they can actually cover their debt payments and still live well (when is the last time you saw a starving doctor in the United States?). Separate data from Medscape's 8th Physician Compensation Report for 2018 states that the average U.S. primary care physician earns $223,000 annually. Meanwhile, medical specialists earn an average of $329,000, as of 2018. Across all specialties, Medscape found that the average salary for physicians is $299,000. The conflation of high debt levels for medical students and undergrads is widespread and, as we'll see, vastly misleading. Here's a recent tweet from Sen. Bernie Sanders (I-Vt.), who is running for the Democratic presidential nomination and has long advocated making public colleges tuition-free. Sanders must be talking about people who are pursuing graduate degrees, including medical degrees, law degrees, and MBAs, all of which are associated with high-income jobs. Otherwise, it's hard to see how, given various public limits on borrowing, how they could actually take on that much debt. Should we really be concerned as a matter of public policy that someone training to be a doctor takes on $200,000 in debt that they will easily be able to pay off? Especially if the option is that somehow taxpayers end up either footing the bill or forgiving the debt? I think not. Simple fairness suggests that the people getting the benefit of something should foot most of the bill, shouldn't they? NYU is a private college and is free to do whatever it wants regarding its own cost structure, but publicly subsidized loans are a different matter. But what about undergrads? Aren't they drowning in debt and isn't a college degree now a prerequisite for the crappiest kind of part-time gig that doesn't even offer health insurance or a reliable source of income for recent graduates? The sum total of student debt at all levels is around $1.5 trillion, more than the nation's total credit card debt. This seemingly is a crisis in and of itself. Here's a tweet from Rep. Ilhan Omar (D-Minn.), making a claim that accords with many Democratic presidential candidates, including Sanders, Julian Castro, and Sens. Elizabeth Warren (D-Mass. ), Cory Booker (D-N.J.), Kamala Harris (D-Calif.), Kirsten Gillibrand (D-N.Y.), and Amy Klobuchar (D-Minn.), all of whom have announced support for some form of tuition- or debt-free college. When you throw around a figure like $1.5 trillion, you get a lot of attention. But when you break it down to the individual level, the numbers are a lot less terrifying. According to Lending Tree's Student Loan Hero website (which uses data from the New York Federal Reserve and other institutions that track this sort of thing), about 70 percent of members of the Class of 2018 graduated with debt. The median monthly payment was $222. The median borrower with outstanding student loan debt for his or her own education owed $17,000 in 2016. The amount owed varies considerably, however. A quarter of borrowers with outstanding debt reported owing $7,000 or less, while another quarter owed $43,000 or more. Educational attainment helps explain this variation. 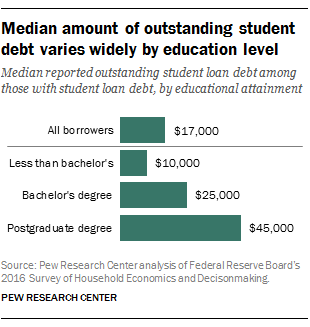 Among borrowers of all ages with outstanding student loan debt, the median self-reported amount owed among those with less than a bachelor's degree was $10,000. Bachelor's degree holders owed a median of $25,000, while those with a postgraduate degree owed a median of $45,000. When you drill down to the individual level, the picture is much less scary, isn't it? Especially when you factor in how much better off college graduates (or even people with some college) tend to do than counterparts with just a high school degree. The unemployment rate of college grads is typically less than half the rate for high-school grads and the median take-home pay for people with B.A.s is $1,173 versus $712 for high school grads. There are many variables involved (such as college major and profession), but the Social Security Administration calculates that male college graduates earn about $900,000 more than male high school grads over the course of their working lives. For women, the college premium is $630,000. While there's no question that the cost of college has increased faster than the general rate of inflation, there's been no drop-off in the number of recent high school graduates enrolling in college. According to the National Center for Education Statistics (NCES), in 2016 (the most recent year for which data is given), 70 percent of recent high school grads enrolled in college, a percentage that has been stable or trending upward for the past 15 years (as a comparison, in 1980, just 50 percent of recent grads went on to college). For those of us who care about access to higher education for lower-income Americans, the gap between enrollment rates for high- and low-income students has shrunk to its lowest point ever. Paradoxically, college may cost more than ever and yet be more available to those who want to attend. Americans who have a college degree earn more than Americans who don't. As a progressive, I have a hard time getting my head around the idea of a majority who earn less because they didn't go to college subsidizing a minority who earn more because they did. That sounds about right to me, and it opens up a broader discussion of one of the major themes of the Democratic presidential nomination process so far. Candidates are tripping over one another to offer more free stuff—not just college, but "Medicare for All," childcare for all, and more, most of which would theoretically be paid for by taxes on billionaires and the "super-rich" or simply by printing more and more money. President Trump and many, if not most, Republicans offer their own variation of free stuff in the form of tax cuts that are not balanced by spending cuts, resulting in higher and higher national debt that will eventually be paid off in the form of higher taxes, reduced services, inflation, or a combination of all three. Somewhere in the 21st century, both Republicans and Democrats gave up on the idea of paying for your own stuff if you could afford to, replacing it instead with the notion that government can be all things to all people (or, government can be all things to your supporters and screw the other side). And here we are, with a government that will be running trillion-dollar deficits for the next decade or more. If there ever was a time to say that people can afford to pay for their own insurance, education, retirement, housing, you name it, that time is now. And it's good to see at least one of the Democratic hopefuls articulating a principle that should be central to all public policy discussions.